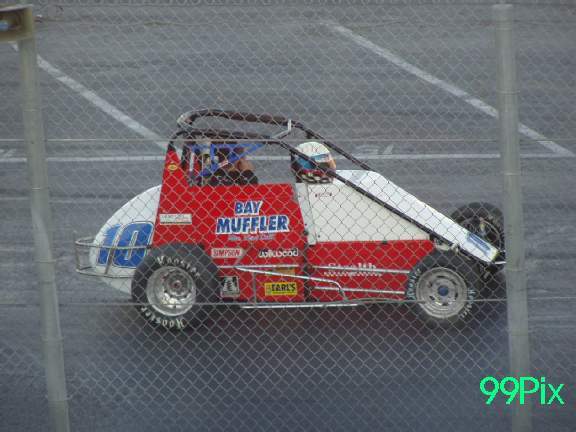 Clayton’s Mark DeBeaumont, #11D, wrecked during his heat race earlier in the evening, and still managed to hold off Robby Flock of Temecula on the final lap for the checkered flag in the BCRA Midgets main event on LAGORIO COMMUNICATIONS night at Stockton 99 Speedway. DeBeaumont led the final 15 laps after taking the lead away from San Francisco’s Cliff Servetti on lap 15 of the 30-lap showcase. Flock, who started 15th, made one final attempt on the last lap to dive inside DeBeaumont, but his move failed. Newark’s Glenn Carson placed third and Turlock’s Cameron Beard finished fourth in front of American Canyon’s Travis Berryhill, #11, the night's midget trophy dash winner. In a two-car battle for the Western Late Model winner’s circle, veteran Harry Belleto, #74, of Modesto outdueled Roseville’s Eric Schmidt, #05, for his third win of the season. 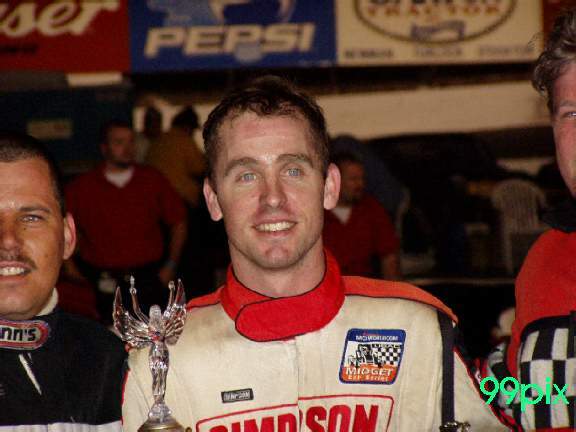 Belleto led the final 19 laps while Schmidt maintained front position for eight of the 30 laps. Rookie John Moore of Granite Bay placed third ahead of Lincoln’s Phil Perry. 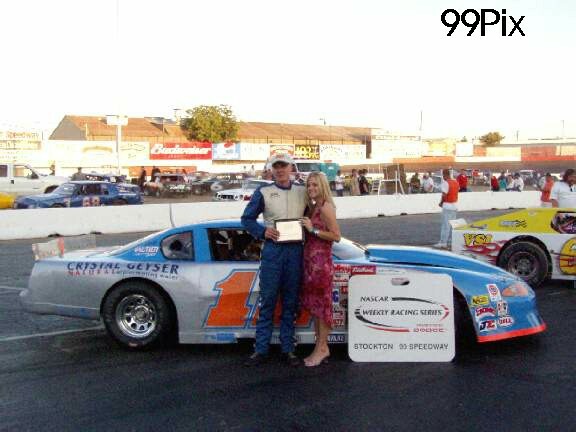 Gary Shafer Jr., #96, of Stockton won his fourth race of the season and grabbed the checkered flag for the fourth time in five races in the Pure Stock division. 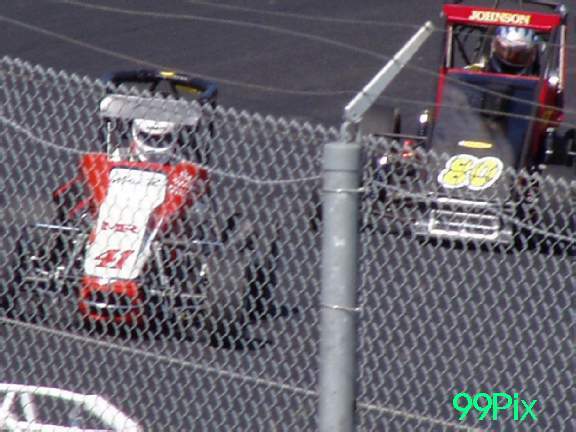 Shafer Jr., who would have won five consecutive races if not for a disqualification last week, bumped with Stockton’s Chad Holman, #75, on turn 4 and forged ahead on lap 16. 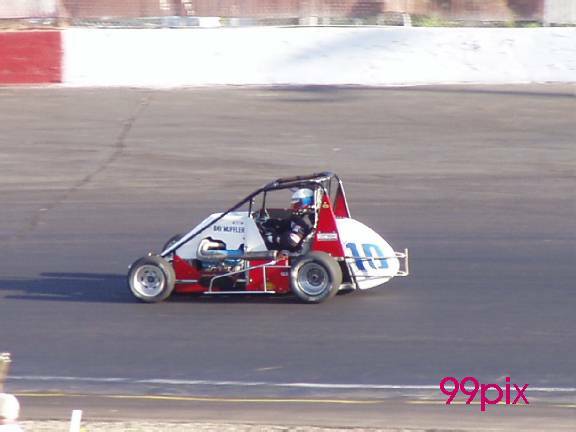 Stockton’s Kannai Scantlen, #8, led the first 10 laps before finishing third. Last week’s winner, Tom Dahl of Stockton, placed fourth. 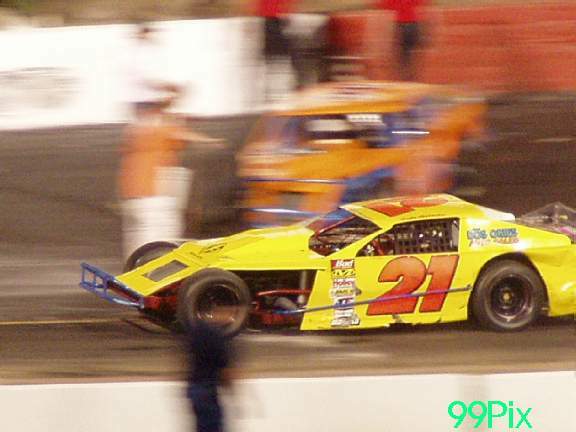 Modesto’s Kyle Gottula, #21, led 20 laps after a wild incident with Sacramento’s Jason Philpot, but it was Ripon’s Angelo Queirolo, (right), who won his first race of the season in the Grand American Modified division. Queirolo took his first lead on lap 27 restart and pulled away from Gottula for the 30-lap main event victory. On lap 7, Gottula and Philpot collided near the start-finish line, sending Gottula’s car on top of Philpot. Gottula was later disqualified for not making car weight. 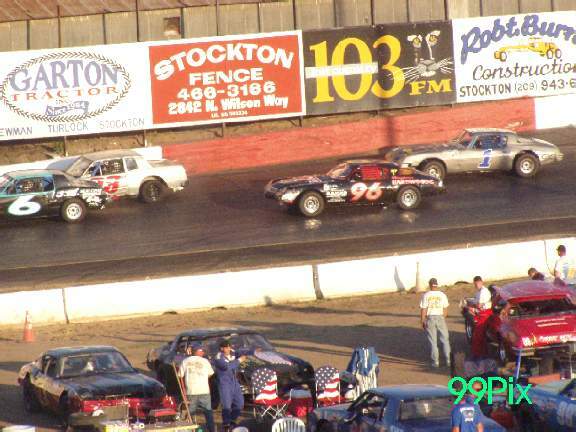 Stockton 99 Speedway returns to its regular schedule this upcoming Saturday night. Western Late Models, Pure Stocks and Grand American Modifieds will also be joined by the return of Pro 4 Trucks and Legends. 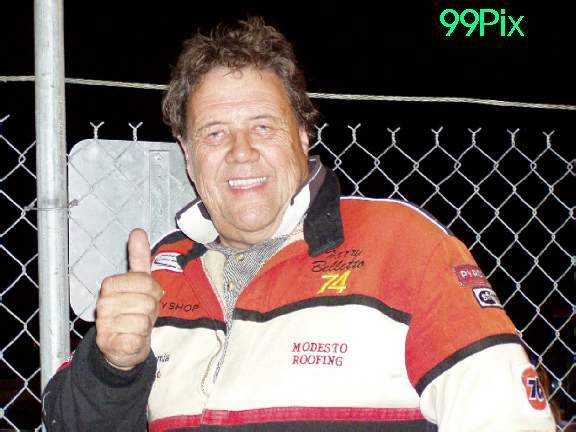 Race car drivers aren't known for giving back victories, and Harry Belletto of Modesto won't give back the 80th of his career at Stockton 99 Speedway. A few more cars to compete with would be nice, though. Belletto, #74, won a three-lap side-by-side duel for the lead with Eric Schmidt, #05, of Roseville midway through the 30-lap Western Late Model main event and held on to win Saturday night before a crowd of 624. Belletto's third win this season came in a nine-car race. Schmidt, the track points leader, was second. The win and top-five finish was good for both in their quest for the NASCAR Weekly Racing Series Northwest Region championship. The car count, which figures into the Competition Performance Index that ranks drivers, wasn't. "You need that 18, 20 cars so when you get a win, it's, 'Boom,' " said Belletto, the defending and three-time track champion who's second in points. 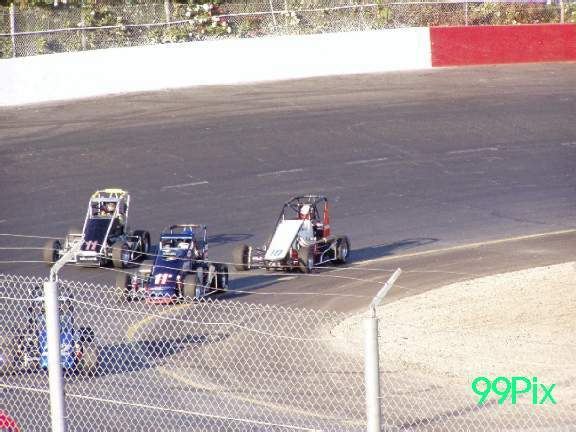 Schmidt and Belletto were running 1-2 by the fifth lap, and Belletto was on Schmidt's bumper coming out of turn four on laps nine and 10. 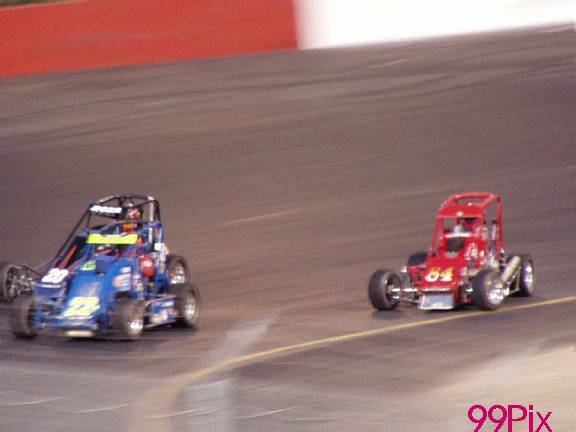 They went side by side from laps 12-14 before Belletto, running outside, took the lead going into turn one. "He gave us plenty of room to race, and that's what it's all about," Belletto said of Schmidt, who has three wins this season. 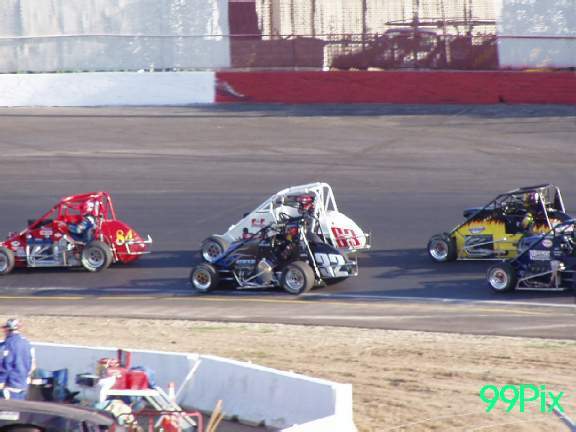 Angelo Queirolo, #44, of Ripon took the lead from Kyle Gottula, #21, of Modesto on a restart three laps from the end and won the 30-lap main. Gottula, who was disqualified from the main because his car was too light, overcame an incident with Jason Philpot of Sacramento on lap seven and built a big lead before Ed Cullom of Ripon hit the wall to bring out the late yellow flag. Gottula and Philpot came together at the start/finish line, and Gottula's right wheels went airborne. Gary Shafer Jr., #96, took the lead from Chad Holman on the 17th lap and went on to win the 30-lap feature. Shafer, who was disqualified last Saturday for illegal shocks and bushings, recorded his fourth victory this season and the 13th of his career. Holman was second and Kannai Scantlen third for a 1-2-3 Stockton finish. 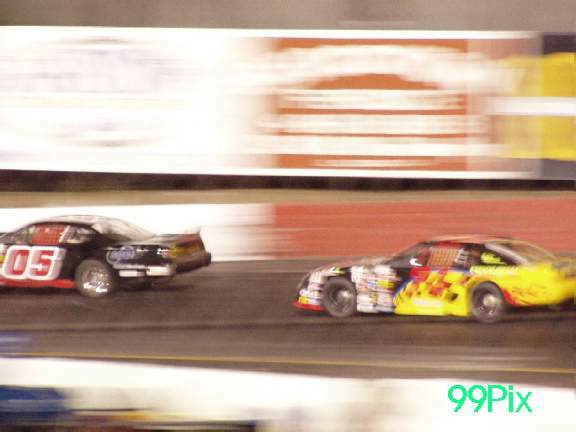 Scantlen led the first 10 laps. Shafer also set fast time and won the trophy dash, both for the second time this year. Marc DeBeaumont, #11D, of Clayton went from the wall to the winner's circle. 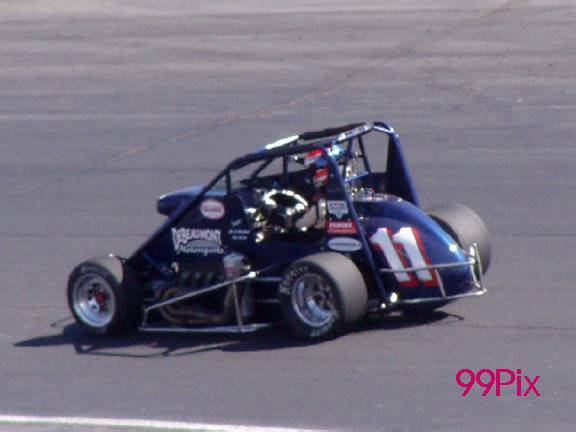 He took the lead on lap 15 and held off four-time USAC champion Robby Flock,#10, of Temecula on a restart on the 30th and final lap. 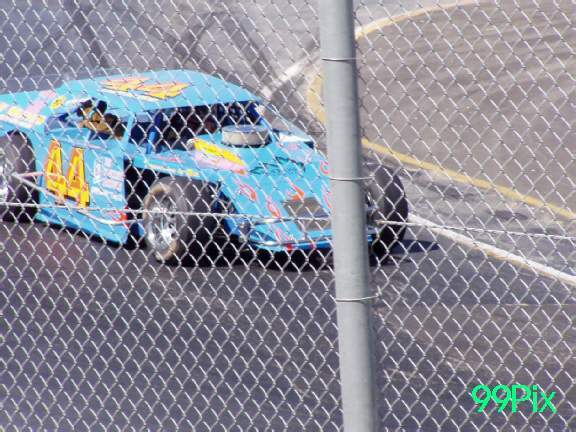 DeBeaumont hit the wall in turn four early in the third heat and had to replace the front end. "Shocks, everything,' he said. "We put (the set-up) back where we had it and hoped everything was tight." 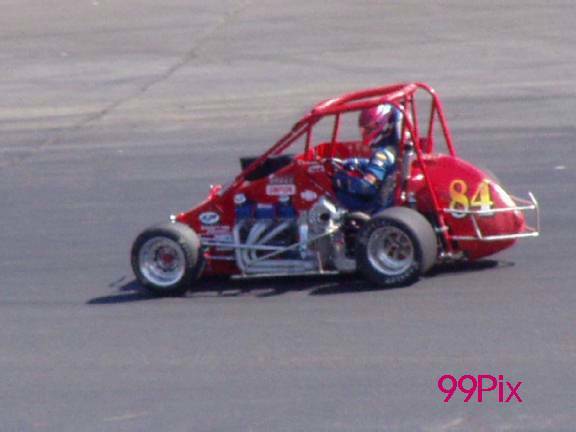 John Sarale of Stockton qualified fifth and moved into fifth place on lap 20 in the main but spun out on lap 22 and finished 13th in the 20-car field. 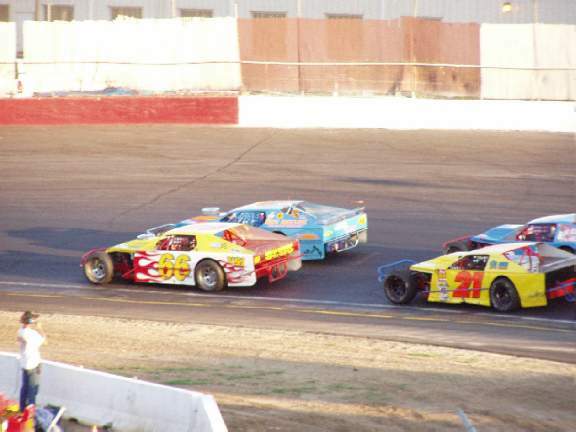 At Madera, Mike Duncan of Bakersfield led all 152 laps and won the NAPA Auto Parts 150 at Madera Speedway. 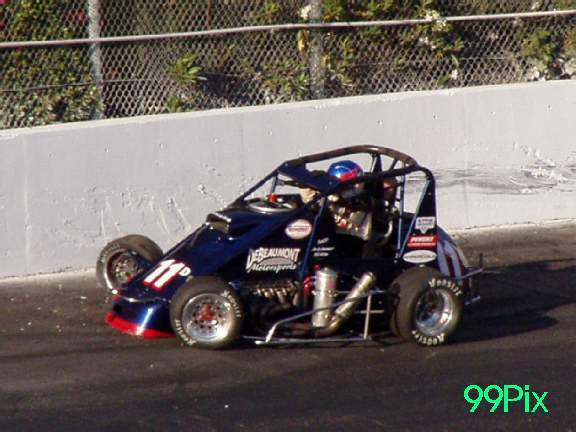 Mike David of Modesto ran second for all 152 laps. John Borneman finished third, Scott Lynch fourth and Eric Holmes of Escalon fifth. 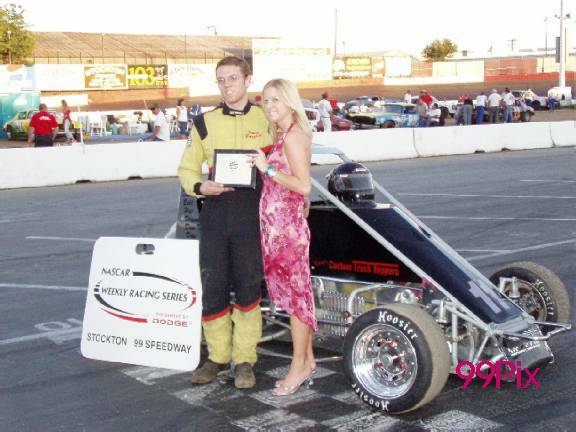 STOCKTON, CA., MAY 31: Marc DeBeaumont overcame a heat race crash to come back and take control of the main event at the midway point at the Stockton "99" Speedway, scoring his first Bay Cities Racing Association Midget win since 1999. 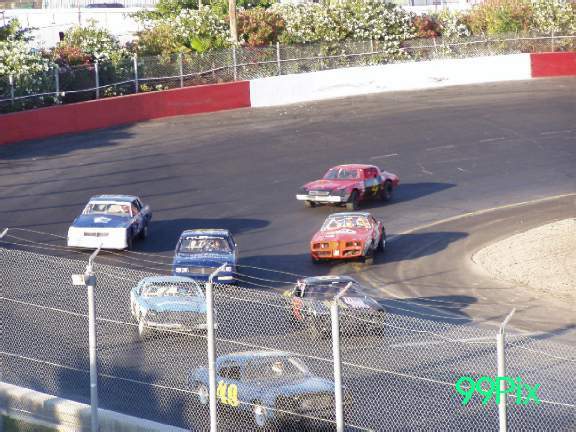 In a close finish, DeBeaumont, #11D, piloted his Ed Pink Ford/Stealth over a charging Robby Flock and Glenn Carson in the second round of the BCRA Shasta Marina Resort Pavement Championship Series event. DeBeaumont made hard contact with the wall during his heat race. 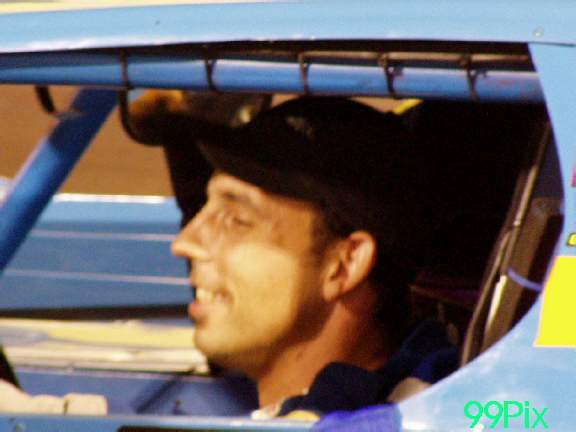 He borrowed a front end assembly from fellow racer Cliff Servetti and the crew worked feverishly to prepare the car for the feature, while missing the trophy dash.Rookie Steve Roza led off the 20 starters from the pole, navigating the fast quarter-mile banked and paved oval as the leader for the first four laps in the Bob Roza Esslinger/Stewart. Cliff Servetti charged from fourth to take second on lap-two aboard his Custom Engine Brayton Buick Stealth with eighth-starting Lee Yeller moving the Ron Yetter Gaerte/Hawk to third. Cameron Beard quickly maneuvered his VanDyne/Edmunds from tenth to capture fourth by the third round. 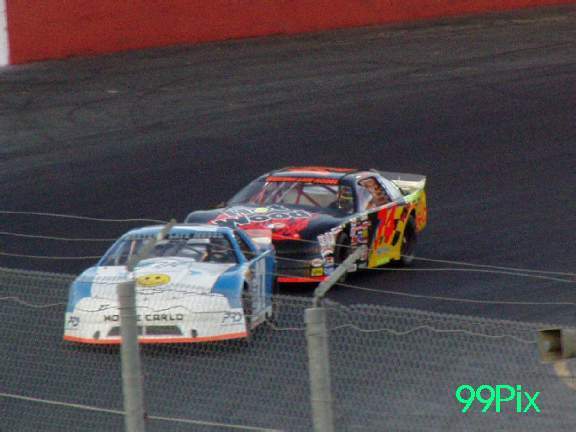 Rookie John Lomier spun on the fourth lap to bring out the first caution flag. At this point front row starter Darryl Marlin held fifth over Carson's Bock Esslinger/Stealth, Gary Dickenson in his Pontiac/Stealth, Dan Gundo's Gaerte/Stealth and DeBeaumont.At the drop of the green Servetti challenged Roza, taking control on the fifth circuit as Roza dropped to fourth with Yetter and Beard moving up. Carson was up to fifth with DeBeaumont pulling into seventh behind Dickenson. During these early laps 16th starting Flock, #10, made marginal progress aboard the Walker Racing Esslinger/Stealth and was laying 10th when the caution appeared on the 11th lap for a spinning Rob Russell in the Guerrini Gaerte Ford/Stealth. DeBeaumont held fourth. Roza dropped out with overheating problems. 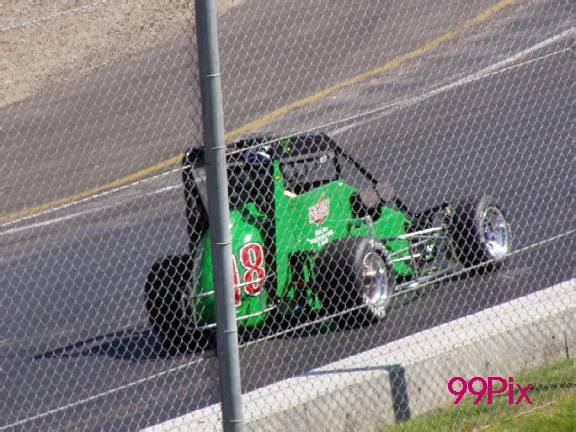 On lap 13 DeBeaumont nipped Beard for third with Carson in fifth over Dickenson and Floyd Alvis in his Interstate Batteries, #18, VanDyne/Stealth. At this point John Sarale had moved the Sarale/Arata Gaerte/Beast into eighth with Flock up to ninth. DeBeaumont bested Yetter, #22p, for second on the 14th round and immediately pressured the leader, moving low exiting the fourth turn to take the lead from Servetti. One lap later Yetter passed for second as Servetti began fading. 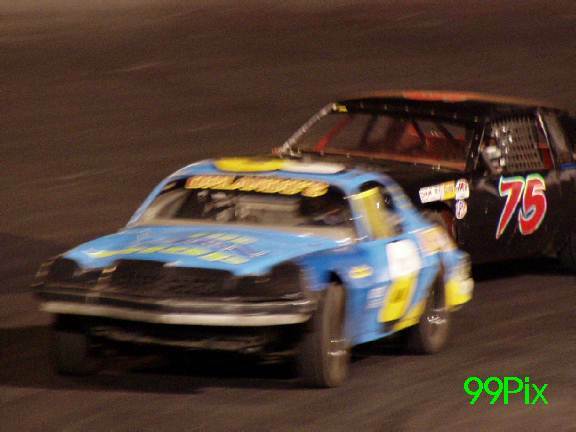 Dallen McKenney raced into the fray, taking ninth on the 18th round.On the 23rd lap a brakeless Sarale spun in turn-two, bringing out the yellow flag.On the restart it was DeBeaumont over Yetter, Beard, Carson and Flock, with McKenney, Servetti, Travis Berryhill, Gundo and Dickenson rounding out the top-ten as Alvis faded to 11th.The charging four-time USAC Western States champion Flock took Carson for fourth on the 25th lap, then Beard for third on the 27th round.McKenney experienced engine problems and coasted to a stop exiting turn-two for a 28th lap caution flag. On the restart Flock charged under Yetter to take second with Yetter's lack of acceleration dropping him to sixth. Gundo and Russell made contact with both continuing. 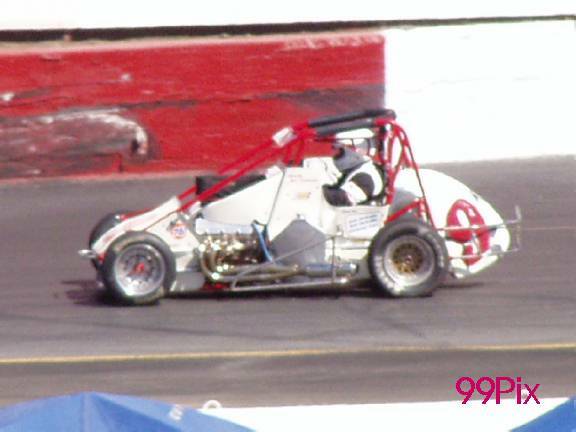 Sarale, still experiencing brake problems, spun in turn-three on the 29th lap for the final caution flag as Dickenson dropped out. In the race to the finish, Flock put pressure to bear on DeBeaumont, but the former '95 BCRA and '99 USAC champ was up to the task, taking starter John Moreland's checkered flag over Flock, Carson, Beard, Berryhill, Yetter, Alvis, Servetti, John Harkrader, Russell, Gundo and Bill Lindsey in the crowd-pleasing feature. Flock out-qualified the 23-car field at 13.757. 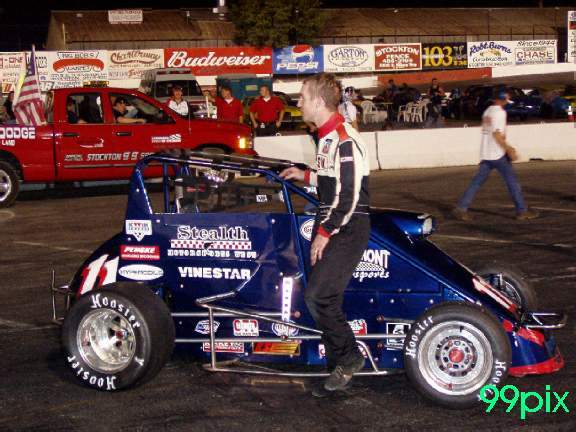 Pete Davis won the first heat race, then experienced engine problems following the checkered flag to end his evening. Marlin and Lomier followed. Servetti won heat-two over Dickenson and Gundo with Beard taking the third eight-lapper over Russell and Sarale. Berryhill won the four-lap dash over Flock, McKenney and Sarale.The marked DeBeaumont's first BCRA win since winning at Stockton in May of '99. The Western States Stealth Distributor has pared down his racing activities to attend to his business interests, but returned to racing to contest the BCRA Shasta Marina Resort Pavement Championship Series that is hosted by owner/driver and Shasta Marina Resort owner John Harkrader, #9.Travis Johnson, who was leading the Shasta Marina series and was third in overall points, had severe engine problems during practice and headed back to Tacoma, WA. 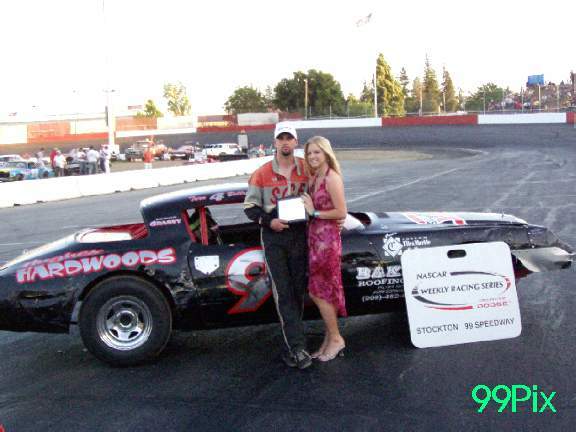 Johnson and the entire BCRA entourage will compete at the Lakeport Speedway on June 7, followed on June 14 by the BCRA/WMRA "Pacific Northwest Championship" at the Shasta Speedway in Anderson.